Gingerbread cookies baking in the oven. A roaring fire in the fireplace. Snow gently covering the countryside. Wrong season? Well, take a little sip of eggnog, because Christmas has arrived! Last weekend, our town had their annual yard sale weekend and I seemed to have a Christmas theme going. 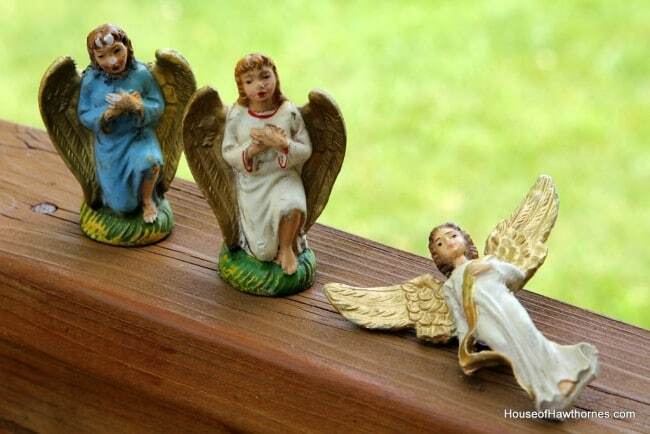 I found an abundance of old nativity set pieces. A lot of them have original store stickers of 29 cents on them (is there no cent sign on keyboards?) and some have stickers of 39 cents on them, so I think they are from two different sets. I mean, why would the Joseph cost less than the man bringing gold? The only thing missing is Jesus. I’d make a joke about Jesus being missing in a lot of people’s lives or something like that, but I don’t do well with religious comedy. Better to stay away from that whole ball of wax. 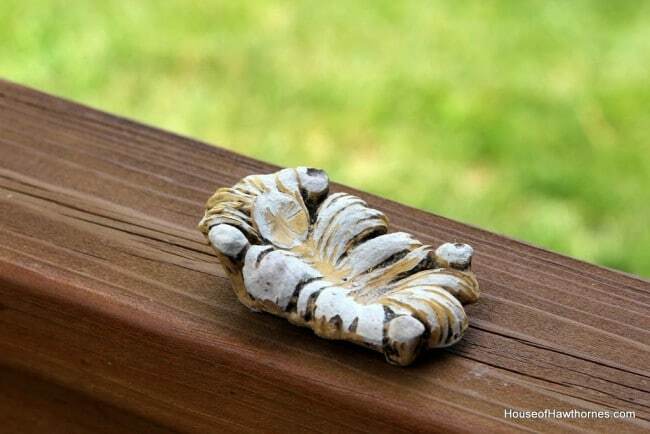 These pieces are totally different and made from a more rubbery substance. 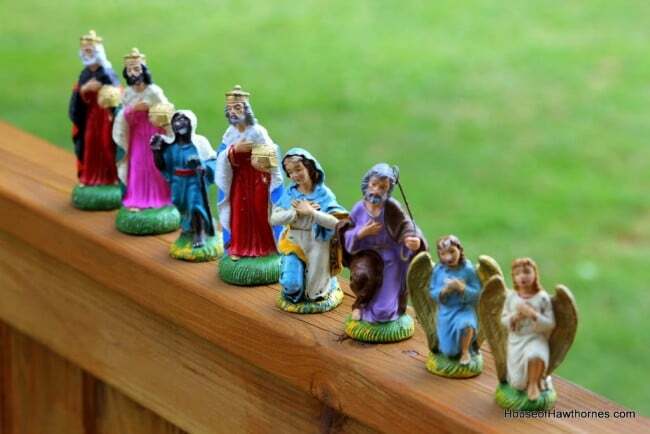 I’m not picky about my nativity people, you can be rubber, you can be chalkware, you can be 12 inches tall or 4 inches tall. All are welcome in my home. The shepherd has gone missing since I took this photo yesterday. I suspect Otis, the cat, just because he is known to have sticky fingers paws. 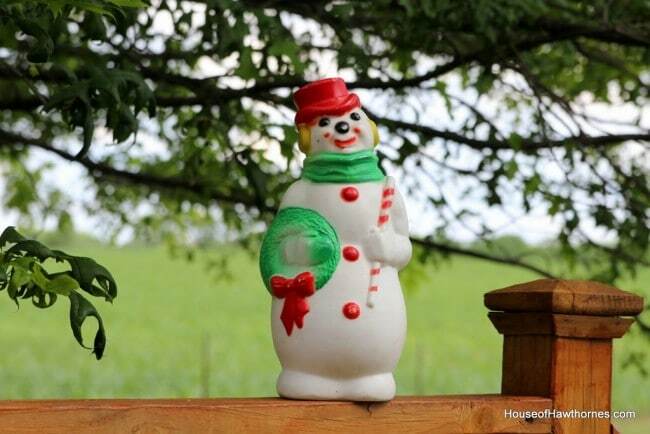 I also found a cute little blow mold snowman. He’s not one of those huge obnoxious blow molds. I’d never buy one of those unless I found it for a really good price. Oh wait, I was looking at a set of those huge candles you put on your front porch a few weeks ago. Anyhow, he’s about 18 inches tall and made by Empire Plastics in 1968 (the date is stamped on the back of most blow molds). And then just to break up the Christmas theme, I bought these enamelware containers. 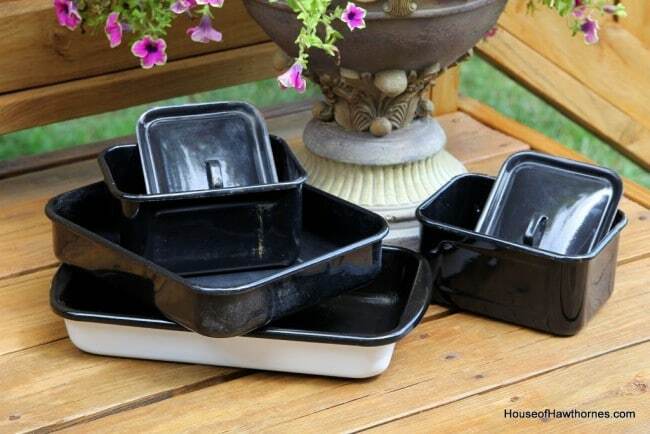 I’m going to use the two smaller containers with lids for storage in my office, but the guy gave me all of them for one price, so who knows what I will do with the others. Hope you had a productive weekend. I’m off to paint my back door. The dogs like to “knock on it” with their nails when they want in, so it’s in dire need of some attention. I hit some of the Groveport sales too! Surprised I didn’t bump into you! Best time to get Christmas is at the summer sales! I found a set of those vintage stacking ottomans from the 70’s at one of the Groveport sales. I have ALWAYS wanted a set of them! So excited to make them over! 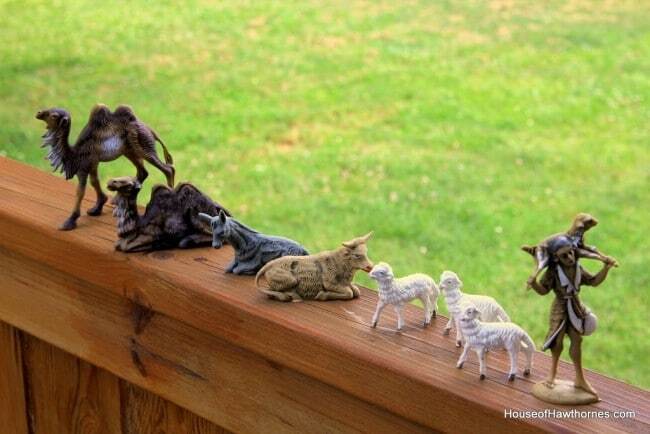 Love your finds…especially the wonderful nativity pieces! Obnoxious Blow Molds….say it over and over again…I like the phrase. Sounds nicely fiendish. Good nativity score-you could make a baby Jesus out of epoxy putty. I just made a rose and I cannot make anything you know that. You had me going there for a minute…. Great use of the enamelware. Love the snowman!!! I have only ever seen one and I bought it!! I was totally into the gingersnaps and roaring fire. It was in the low 40’s here the other night. GREAT finds. ENJOY! I made it to only a couple of the sales – and, sadly, found nothing, but that was much ’cause I was still recovering from the previous weekend in Springfield! (lol) You did quite well! LOL! You had me wondering for a minute, Pam, if I had gotten an old holiday post in my dashboard! : ) You found some great pieces. The containers are great, too. Maybe the big ones would be good for succulents or a fairy garden. I’ve got fairy gardens on my mind; I told my daughter that will be our project this coming week. I can’t say I was very productive. Reading blogs, taking it easy. Forced to. I hate to sit still. But I love visiting my buds! What super holiday goodies. Big score on the enamelware too. Wow, for a minute there I thought you were going to say you got an inch of snow! Whew. Summer is way to short as it is. I had to laugh–you and your missing Jesus. :) I’ll try to find Jesus for you:) The enamelware is great! 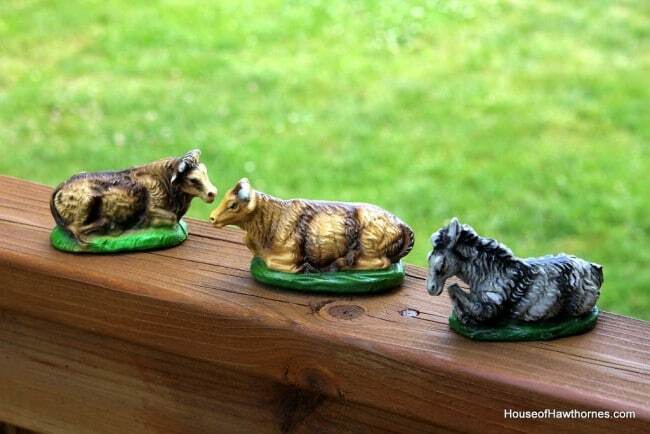 I just bought an antique nativity this past weekend, too. Mine is from Germany, made of composite, but the Jesus is not original to the set, at least…. I’m thinking he’s not… His head is bigger than Mary’s. Merry Christmas to you! I had to laugh at the missing Jesus comment. I love finding old Nativity figures, how fun. Here is a book you will have to find, it is a children’s story, actually for all ages called “Are You Missing Baby Jesus” about a little boy who gets and extra Jesus figure in his nativity box. It is very sweet story.